Google Maps may be the go-to mapping and navigation app for a grand majority of Android users, but that doesn't stop the competition from pushing ahead, adding new features, and trying to grab more users. 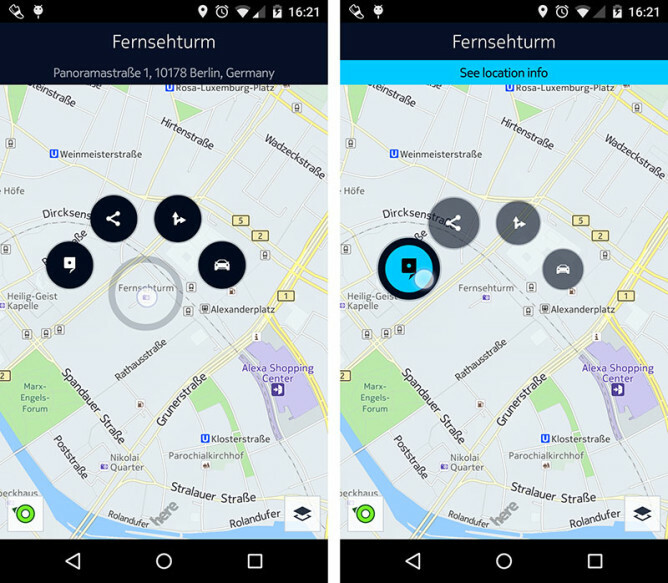 That's the case with HERE Maps, which is not content with offering a better offline mapping experience, but keeps on trickling updates to its Android app. Lately, it added reversible lane support in 12 cities, and now it's launching a beta program to help you test out new features before they make it into the stable release. The first beta adds a contextual menu that springs up whenever you tap and hold anywhere on the map. It'll give you 4 bubbles to see the location's information, share it, get directions to it, or start navigation towards it. The team says they'll offer monthly updates to the beta, and you'll be able to see a changelog in the Play Store to know what's new. You can access the beta, which is only available in English by the way, by joining this Google Group, then heading to this page to become a tester, and finally downloading the app from the Play Store.